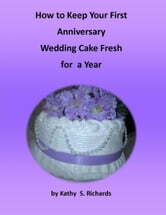 With just a few simple steps you can keep your first anniversary cake fresh for a year. You will be taken through step by step procedures to storing the first tier of your wedding cake that will ensure the taste will still be delicious on your 1st anniversary celebration. This procedure works great on all cakes and is easy to do. Make this "How To" part of your wedding plans today!